The old story goes that if you speak three languages, you’re trilingual; if you speak two languages, you’re bi-lingual; if you speak one language, you’re American. Johanna Torres, founder and CEO of Language Loop LLC, a start-up based in Chicago’s West Loop neighborhood, is trying to change that as she tutors a wide range of clients in any of 14 major languages and helps clients new to America with English-as-a-second-language skills. Language Loop’s target market is “anyone 12 years of ageand up; currently the majority of our work is with young professionals, but we are positioned to do much more,” Ms. Torres reports. Languages offered at Language Loop include English, Spanish, French, Italian, German, Russian, Portuguese, Chinese, Japanese, Vietnamese, Polish, Dutch, Arabic, Farsi and Turkish, fifteen languages in all. Teaching language has always been a specialty of Johanna’s. 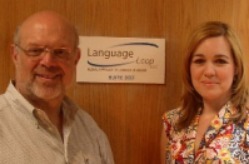 Before Language Loop, she rose to Chicago area senior manager for the nation’s foremost language schools. “With this experience and an advanced degree in Communications, I knew exactly what I wanted to do with the language and teaching parts of my schools; the business part of it was another thing altogether.” Johanna called SCORE in March of 2006 and set an appointment to talk about business issues as wide ranging as office location and hiring and compensation of independent contractors, to the mechanics of getting started, business structure and marketing—plus web design and the ways that the Internet could become a part of Language Loop. Over the next several months Ms. Torres had fifteen counseling sessions with SCORE—three faceto-face at the SCORE Chicago office, three on site at Language Loop and nine on line. “My SCORE counselors Michael Koen and Roger Loeffler provided an incredible range of expertise: Michael in operations, finance and accounting; Roger in marketing. Between them they helped prepare me for a July 2006 opening. By October I reached 25% of classroom capacity which was far beyond by expectations for the first quarter of operation.